How far will those in government go to protect their power and squash radical voices? Bribery. Perjury. Assassination attempts. Illegal wiretapping. Witness intimidation. Spies. Communism accusations. Hand-picked judges. Not here in America…Yes, here. 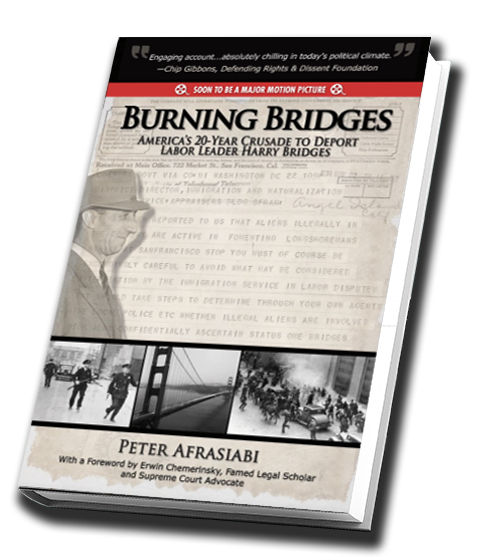 Read the epic true story of the longest deportation court battle in American history, a case that haunts our legal system to this day and forces us to ask, is anyone safe? Based on declassified FBI documents, including documents from J. Edgar Hoover’s vault and previously-secret National Archives documents, this is the first full account of the twenty-year legal campaign waged by government lawyers and policymakers, in secret conjunction with private enterprise, to deport radical labor leader Harry Bridges. This is the story of the rise and fall of due process, where those who are supposed to be the very agents of due process—government prosecutors, federal investigators, legislators, and judges—bent and warped the Constitution in a means-justify-ends crusade to silence Bridges’ vociferous labor voice. Harry Bridges had one hope for safety from the government agents abusing their power, the hope that the federal judges of the constitutionally-decreed neutral federal courts would stand firm against the political branches and protect the weak against the powerful. And so this is also the critical story of whether our federal courts show real fidelity to cherished American virtues of due process and separation of powers. Three-quarters of a century on, the legacy of the Harry Bridges trials still haunt America’s legal system and are critical to assess because Americans today, in the modern techno-surveillance state, face the greatest threat of government intrusions into civil liberties since Bridges’ era.